OK time for the granola cereal recipe. Sadly, I will be giving it to off memory because my computer failed to save it (probably user error). This should help you a lot though and of course you can adapt it to your own family. I am sorry on the delay for this post. Since there was a delay don’t forget to look for the clues to the giveaway mystery box. Peanut Butter and Chocolate Chips (as many or as few as you want). In a saucepan on medium warm the peanut butter, agave nectar, and brown sugar till it is almost liquid. Make sure you stir constantly or it will burn. Line a baking pan with wax paper or foil. Mix oats and liquid mix in the pan. This is best done with your hands. Put chocolate chips on top. As for baking I baked at 350 for 35 minutes and put in refrigerator over night. Once they have set just pull up the wax paper and it will begin to crumble. I am not sure how long this will store in a ziplock bag as my kids ate it all in a week. It cost about the same as a box of cereal and I knew exactly what was in it. I may not have got my granola bars but the cereal was a fantastic mistake. A small amount in milk fills my kids up quickly. I also gave them some dry and it seemed to be a nice energy perk while we played at the park. Yesterday I attempted to make homemade granola bars. Have I told you I can cook but I can not bake? If not, now you know. I thought these would be easy. First let me clear up some confusion; its hard to go to the store and buy granola. 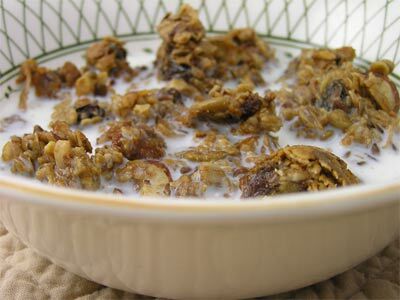 Being new to being healthy I did not realize with the oats and honey and such you are actually making the granola. Boy did I feel dumb when I looked up the definition of granola. Anyways, I looked at several recipes and found I did not have this or that for each one. UGH! I did not feel like a trip to the store so I got creative! I took a little but from 4 different recipes and combined it while crossing my fingers. Just like with the ingredients my cooking methods were a combination. To start with I mixed my wet ingredients and my sugar in a pot and cooked it on medium till it was runny. I had to do this twice, so remember STIR! The first time I put my ever handy Robostir in to the job. Typically this works great to stir things for me but the mixture was too thick and burnt. The second batch came out much better! I went to line a pan with wax paper only to find out my only option was tin foil. Oh well, I figured maybe it would give them some crisp. The trio of recipes all had different “cooking” methods; bake , refrigerate, and just let sit. I mixed my dry ingredients and mixture in the pan by hand. I did as all three recipes said and packed it down tight. My bars got topped off with some chocolate chips and tossed in the oven an 1/2 hour. I thought it wont be long and I will have a yummy and gooey treat. Wrong! After allowing it to cool it still fell apart. Methods 2 and 3 now needed to be tried. I covered my creation and let it sit a few hours only to see it crumbled. This time I had hubby pack it really tight and it found a home for the night in the refrigerator. This morning was like Christmas for a kid untill I saw my still crumbling “bars.” I was sad but this failure was no shock. As I said I cannot bake. Hubby got smart. He tossed all the crumbles – big and small – in a bag and told me we had cereal. Hmmmmmm. Just maybe we was right. The girls LOVED it. All three ate every bite and did not complain about being hungry an hour later. Overall it cost about the same as a bag of cereal and I know whats in it. 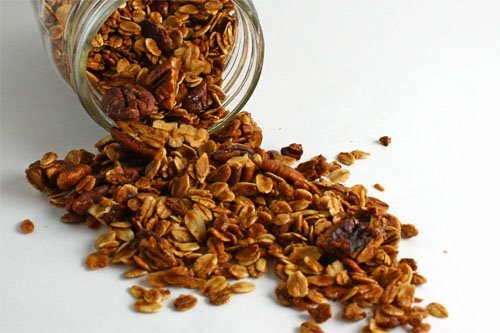 We will be making Granola Cereal more often with different varieties! Tomorrow I will post a recipe and a picture! Giveaway Clue#1 Step by Step you will get healthy! Win the giveaway and you can take a step towards measuring your daily health! 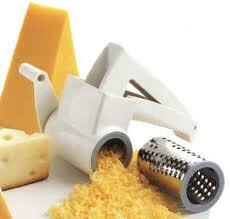 You can use your cheese grater for things other than cheese and it can help you eat healthier. It allows you to have some food in moderation and other foods fresh. I love to use mine. I will tell you though, I hate traditional cheese shredders. I have a rotary cheese grater (not the one linked). The make shredding anything easy and you wont get your fingers caught. So here are some food other than cheese you can use in the cheese grater. Chocolate! Yes, chocolate and healthy can go together! I take 1 square of dark chocolate and shred it over my girls yogurt as a special treat. I also shred it over my yogurt or into my smoothies when I have a craving. Garlic. Fresh garlic taste so much better than what you buy in the seasoning section, plus there are no preservatives or additives. Just drop in a clove (whole or cut in two) and start shredding. Onions. Again fresh is so much better than dried! My family hates to see chopped onions but grated onions cook down smaller and I get the great taste. Nuts. I hate to chop just about anything because sometimes I chop my fingers. If you have a rotary grater you can use it and your nuts will come out just the same. Personally, I think it’s easier and faster. Sneaky Veggies! That’s right, use your cheese grater to sneak vegetables in your family’s food. Grate carrots, broccoli, and more to hide in any sauce you can. They will be harder to notice and harder to pick out. Frozen Butter. I keep extra sticks of butter in the freezer and sadly I don’t always have one thawed out when I need it. I put a stick of butter in grater and grate it into whatever I need to. This is easy and a lot of times make folding butter into something easier. Apples. My 1-year-old loves apples but I am afraid she will choke. I cute pieces and grate them so she can eat apples and I have no fear of her choking. Shred Chicken. Have left over chicken? Place chicken chunks in the grater ans shred it for a wrap, sandwich, or any other use. Potatoes. If you want hash browns then please grate your own potatoes then getting the frozen ones. Fresh wont have lots of things added to it that you don’t need. Cheese! Of course you can use a cheese grater for cheese! Not only is it cheaper but you what you grate at home wont be covered in that yucky powdered cellulose. What other ways do you use your cheese grater? Getting healthy or trying to loose weight? You need support! Even if your goal is just to eat healthier and start working out having people to support you on your off days. I know there are lots of websites and groups out there but I wanted to give you a review on the one I use. MyFitnessPal (MFP) is wonderful! When you sign up for MFP you fill out a profile with all your current information and your goals. 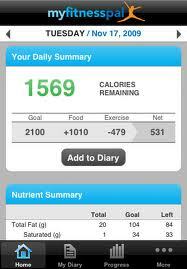 To help you reach your goals MFP provides daily food logs, a recipe calculator, messages boards and more. Each day you log your food and try to stay under goals. It is an eye opener when you start logging food. When you see that the Jumbo Jack you had for lunch is more than half of what you were suppose to have for the day it starts to put things in perspective. MFP has a large database of food making it easy to input your nutritional information. They also allow you to enter food information if it is not in the database yet. Many doctors will tell you food diaries are the first and best step to take to change your eating habits. MFP also provides you will a recipe calcultor on it’s website. Ever cook something at home and wonder about the nutriitional value? This calculator will be your best friend. It is what I use when I cook something for this site. All you have to do is log each food you put in your recipe and tell it how many servings it makes and you have all your information. You can even make your recipes public so your family and friends can log them in their food diary. MFP makes cooking at home but staying within your goals easy. Everyone needs support! From message boards to your MFP friends you will find an abundance of support on MFP. They have many topics in their message boards for you to post questions, comments, or even just post you need a push. You will find recipes, exercise ideas, equipment reviews, and more. You can also make friends on MFP kind of like on Facebook. This great! There is a running feed that shows you when your friends exercise, when they close the day under calories, or when they make comments. You can comment on their updates and they can comment on yours. Again, this is a great motivation when you have a day when you don’t feel your best. On the go a lot? MFP is easy to use on the go too! They have applications for your Android and your Ipad. All you have to do is put the information on your device and it will sync with the website. The Android application I know for sure has a scanner on it where all you have to do is scan the barcode on the product and it will put the infromation in for you. Can it get any easier than that? Nope. I want to say that this review is in no way sponsored by MyFitnessPal. I just wanted to write about a site that has helped me out greatly and can help you too. You can add me as a friend (mammafrog) if you would like. Thank you!